An ongoing project by artists Michael Smith and Joshua White, Open House was commissioned by the New Museum, and presented in its lower level public gallery in 1999 when the institution still resided on Broadway. 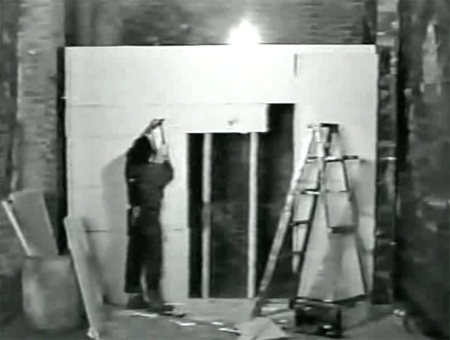 In this version, Open House was a large-scale installation of a Soho artist’s loft belonging to the fictional artist “Mike Smith,” who is created and played by the artist Michael Smith and who, viewers learned through a video-taped sales pitch playing in the entrance to the installation, has lived in the loft for over twenty years, and is now looking to sell it. According to the pitch, the new owner will inherit the loft and, in a gesture that lies somewhere in between personal erasure and a Buddhist-like surrendering of material possessions, the past twenty years of Mike Smith’s art, all made while he lived in Soho. This dual sale—of art and life—turns the Open House installation into both a marketing pitch and a memoir. It presents the artist’s two-decade trajectory in Soho: video-taped documentation of the rigorous building of the loft, which in itself resembles a durational performance art piece of the 1970s, his multi-faceted, multi-media art, his activism, and his personal evolution, all with a price-tag. Presented at a critical juncture in the fictional artist’s life, Mike’s story with Soho ends where Open House begins, with the desire to leave the neighborhood, or what it has become, for some place more affordable and less pretentious. This interview with Michael Smith took place in anticipation of the launch of an online version of Open House —a project that was realized thanks to my colleague John Michael Boling, who worked with Smith to transfer the work from DVD to the web. LAUREN CORNELL: Open House is the story of an artist literally selling out. But the process isn’t corrupt, Mike just seems like he needs change. It’s a big story that unfolds in little parts: fragments of his life and early days in the loft, key works he made, and glimpses of New York living in the 70s and 80s-- all told through a sales pitch. Can you talk about the origins for Open House, how you and Joshua began the project? MICHAEL SMITH: Open House was developed for the New Museum's Public Gallery Space back in 1999. Then Senior Curator Dan Cameron asked me to come up with a project after seeing Musco: 1969-1994, an elaborate installation at the Lauren Wittels Gallery in Soho I made in collaboration with Joshua White. Musco was developed by taking information from Josh's history and experiences with the Joshua Light Show and integrating it with a fictional story of my performance persona, Mike. The piece was all about failure and struggle to adjust to changes in one’s life and culture. The context for that show was also SoHo, so I assume Dan was hoping we could develop a project that might be able to respond to the neighborhood or ethos of the community with a project for the museum's public gallery. We transformed the lower floor gallery into a loft live-work space. Josh was very careful to make it seem like a real loft separate from the museum space, and designed it so that one had to pass through scaffolding in order to enter the installation. He modeled the space after my storefront studio on Elizabeth and Spring St and many of the typical large SoHo loft spaces we were both familiar with. LC: After its incarnation at the New Museum, Open House was made available as an interactive work that encompassed documentation of the installation and the art being sold, which included Interstitial, a public access television show Mike produced, and documentation of his activism with the Sohoods—a collective determined to “protect the avant-garde of Soho” and “keep the wine bars out.” One video is dedicated to the construction of the loft; entitled Sweat Equity, it features you and the artist Guy Smit (playing Larry Seiben) in the laborious throes of erecting walls and painting. There is music, overalls, sweat and a lot, a lot of building—all appearing in black-and-white which seems to signal that the process took place a long time ago. Is this sweat equity reflective of your time in SoHo? Is Open House autobiographical in a way? MS: Open House was autobiographical only insofar that Mike and I happen to be looking for more security and stability in our lives at the same time. The story was based on my experiences I witnessed while living and working on the edge of SoHo for over 20 years. Much of the outline for the show and the trajectory of Mike’s career in Open House was loosely modeled after different types of artists, some of whom confused their new independent lives with thinking of NYC as a new frontier, where ambitions were put to the test. Some needed lots of space to start making their process pieces, whether they were hanging work on a wall or scattering things all over the floor. They needed to stake a claim and acquire real estate. One good thing that came from people building out their lofts was that they learned skills and how to make money with a particular trade, like carpentry or plumbing. Many artists today work on a desktop and support themselves doing computer work. I figured out early on that I did not need a lot of space, and so I pared down and lived and worked with less. I also never learned how to do anything. LC: The size of an artist’s studio can reflect their practice and also influence it. Many artists in NYC today couldn’t even consider getting a studio, so the idea of making large-scale sculpture or scattering things on a floor with a lot of square feet may not feel like an option, where a performance, video or website might. Open House also raises the role that artists play in gentrification. The period of time that the artist Mike Smith of Open House lived in is romanticized; in fact, the freedom and community of that time, the large Soho loft space, has created a certain kind of picture of what an artist looks like and inspired people to move to New York. That aura around Soho is, partly what drove real estate prices up and pushed artists out. It seems that Open House—a kind of fictitious documentary and real estate parable in one—speaks to that cycle of gentrification, with Mike ultimately putting the loft up for sale. MS: Definitely, but I think the prices of Soho were determined by many factors besides the aura created by the bohemian occupants. Artists and loft living helped to develop the allure of the area but also to initiate the rezoning from light industry to residential, opening up the mixed zoning potential of SoHo. Unfortunately, many of them did not write themselves into the story. The struggle over property that many waged and lost consumed their energies and diverted attention away from the prime reason many artists moved to NYC, making art. I am certain there are artists who still come to NYC to be with other artists and others who come to reinvent themselves. There are also those who do not want to deal with the harsh economic realities of NYC. Today there’s other cities, like Philadelphia, Berlin or even Milwaukee; all good places to be and to find a community. Artists lived in Soho because of the inexpensive space. But it also was the area to live in if you called yourself an artist. It’s also in close proximity to the West Village, a historic Bohemian neighborhood that was prohibitive in cost by the time I moved to New York. I am not that interested in the story about the heroic artist or the artist who supposedly goes against the grain, trailblazing a path for others to follow and the critics to acknowledge. What I find compelling are the stories about the people who have ambition and understand the models for success but somehow cannot get the ingredients right for a winning recipe. LC: Mike Smith is exactly that kind of artist—he is in a constant state of struggling and by the time he sells his loft he doesn’t seem to have reached that kind of resolve. Can you describe his body of work? MS: Well, like with any artist it is not easy to do justice to a body of work in a few words. His work is representative of a time and a place, but one thing that’s important to remember is that Mike is not a very good artist. His best work is probably Interstitial. Like many artists of his generation he considered the work he did for public access TV to be his art and in a sense it was the work that best served the community and satisfied his political inclinations. It is the highlight of the installation as it was the highpoint of Mike’s career. Interstitial was much more effective than the actions of the SoHoods, who protested the gentrification of Soho, years after that process was already entrenched. The work of the SoHoods was self-important and always seemed to miss its target. They did some tagging and clandestine actions like putting up signs, but their best moments are probably when they were having fun. The footage reflects this: it’s lively but hardly compelling art. LC: Well, the end result of activism (if not the achievement of goals) can often be simply to build values or community, which the SoHoods seem to have to done, although the Mike of the sales pitch video certainly seems removed from the heat of their original manifesto. One final question: why, as someone who has worked primarily with video, performance and installation, have you chosen to turn Open House into a web-based work? MS: Josh felt the perfect container for the show was a DVD and he was correct. A linear reel hardly could contain all the diversions and tangential characters and connections. The maze-like menu suits the complexity of the piece. Good interview, thanks. Shout out to Michael. I was lucky to have seen Open House in its real space incarnation. It made perfect sense in the old NewMu basement, which was a loft-type space such as the one Smith and White were pseudo-documenting. That gave everything a recursive layer that would be impossible in the new "modern" NewMu. The experience was immersive: you were surrounded on all sides by the archaeological layers of this fictional Soho artist's so-called life of false starts and stopgap solutions, from old paintings stashed in a storage nook to the artist's video-editing "day job" workspace (a room within a room within a room). I remember in Mike's video intro for the installation he talks mock-enthusiastically about "getting his own home page." A late '90s-style HTML interface would have been the perfect way to do the web version. Unfortunately I can't evaluate John Michael's handiwork because I can't get the web version to load. I launch from a pop-up and then my browser says "transferring data from rhizome.org" for a long time. I hit the start button and everything freezes. Instead of downloading the entire site with some indeterminate wait time why not use links to individual bits of content?